Moon Racer landed a monster gamble when running out a commanding length and a half winner of the Weatherbys Champion Bumper at Cheltenham this afternoon. The 9/2 favourite opened up at 11/2 but sustained support in the ring forced his price down a point and the gamble was justified as the David Pipe-trained gelding overcame a tardy start to storm up the hill to score from 33/1 shot Modus. Pipe admitted after the race that the slow start was not the plan. "It didn't really go according to plan," said the trainer. "It wasn't the idea to come from where he came from. 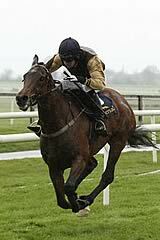 Tom (Scudamore - jockey) sat where he had to sit - he had to really - and took the brave man's route down the inside. There's always a packed field in this type of race. The gaps appeared and then he quickened well. I'm a half pint empty kind of person so I wasn't confident after that start but up the straight I thought he might just stick on. Hopefully this fella's got a bright future. He put up a good performance in October but he needed to up his game today and he certainly has. There's no reason why he can't come back here next year as a novice hurdler. The form of this bumper is working out better and better each year and he's got an engine. "It's great for Caroline Tisdall and Bryan Drew as they've supported me and we can't do it without the owners, the staff at home and everyone around us. It's a relief to get a winner - I told the owners to really savour the moment as they don't come round often and I don't think we ever appreciate them as much as we should." Scudamore was visibly delighted with Moon Racer after the race. "The tactics were forced upon me because of what happened at the start," admitted the jockey. "Somebody got kicked earlier on so there was a bit of a delay and when the tapes went up, he just hesitated a bit. It's only his third ever run and he's never been in a start like that. From then on in, I just thought 'whatever happens, happens'. In the championship races here though, there are no hard luck stories. The best horse in the race usually wins and he was the best horse in the race. It makes a big difference to have the horse to do it underneath you. Even coming down the hill, I was two or three lengths back from where I wanted to be but all of a sudden it's opened for me. He's only been able to go through though as he's got the class to go through those gaps. He's six-years-old so whether that makes a difference or not, I don't know. It's great for Caroline and Bryan as they've been big supporters of Pond House for years now and he was bought to be sent here. He'd fulfilled their dreams and David has done it again. "He was tough and he was brave - he's a true bumper champion. I love him - he's my favourite now!" Modus, a son of Motivator and carrying the colours of Al Kazeem's owner John Deer, ran a tremendous race to finish runner-up. It was the five-year-old's first appearance since he finished unplaced at Aintree in April, a run that followed an eighth-place finish in this race 12 months ago. Given the absence credit must go to his trainer, Monmouthshire-based Robert Stephens. A 33/1 shot ridden by Tom O'Brien, Modus finished a length and a half behind the David Pipe-trained winner Moon Racer, a £225,000 purchase at Brightwells' Cheltenham Sale in April last year. Stephens said: "I'm delighted, because he's a very nice horse and he's been working well at home. He's more relaxed this year, and that's helped him today. "We couldn't run him this season before today because he had taken part in four bumpers so was on the limit allowed, but fitness-wise I knew he was spot on. It was a pity the start was a little ragged, because it meant he was slightly further back than I expected and the winner got first run on us. It's the sort of thing that can happen in this race. "I knew he would fly up the hill. He has a couple of options - he could run on the Flat or we could keep him for hurdling next season." Stephens also trains JCB Triumph Hurdle hope Beltor, of whom he said: "He's in great form and I'm just hoping for a good run on Friday. He doesn't work with Modus because they are very similar horses, so they each have a lead horse." Modus's jockey, Tom O'Brien, said: "He has given me a great spin and he has stayed on really well. He settled nicely and kept going. It's a great training performance by Robert." Third-placed Wait For Me, trained by Philip Hobbs, was ridden by Richard Johnson, who said: "He travelled really well, stayed and kept going all the way to the line. He is a really nice horse. He has just been beaten by the better horse on the day that showed a good turn of foot. He is having just his second run of his life so he will mature and develop into an even better horse. To finish third in the Champion Bumper on just your second start is a brilliant effort. He is a horse we will look forward to going novice hurdling with next year."